Have your home professionally remodeled! Call now for deails & schedule! Call our experts today for professional repairs! You may think that brick houses are invincible, as the old Three Little Pigs story would have you believe, and for the most part you'll probably be right. The world is full of houses that are still standing tall even though several decades or even a century or two have passed since they'd been erected. However, bricks can deteriorate over time. While they are strong and durable, they can be damaged, either due to erosion from the elements or from sudden forceful impacts. Even the smallest cracks can let in water which can result in dampness and mold. If you spot any problems in your property's brickwork, there are a few things you should know. If something smashes into your home, the damage will be obvious and you will undoubtedly act quickly to fix it. However, when the problem is less obvious, like a few seriously cracked bricks, you may miss it, or mistake it for an insignificant issue. The worst thing you can do is ignore the problem. What may seem like nothing could develop into a bigger issue with dampness entering your home and causing mold and mildew to develop. If you do nothing else, call in an expert to carefully examine the cracks and check to make sure if anything needs to be done. It may very well be nothing, but at least then you will know for sure. If you need to have some bricks replaced, you could be facing somewhat of a treasure hunt. It will depend on the age of your property and the availability of the color, size and style of the bricks you need. If your home isn't too old, you may be able to find the exact replacement fairly easily. However, if you have an old property, it may be difficult. 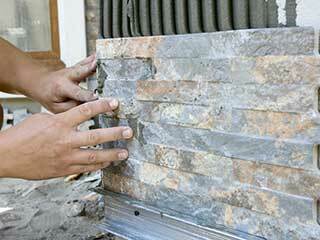 Check around and see if there is a supplier of reclaimed building materials in your area. Once the old, damaged bricks have been removed and the surrounding mortar has been cleared out, it's time to install the new material. This requires a certain level of skill and accuracy, so you're better off letting professionals handle it than trying to do it yourself. The new bricks should have fresh mortar smeared on all sides before being carefully placed into the gap where the old ones were. All that's left to do after that is to clean the area to preserve the look of the wall. Our team at Drywall Repair & Remodeling Hollywood will be happy to help you with this type of issue, or with anything else. 10% OFF - Any Job Over $700! Whether your home’s drywall is looking shabby and could really use some repairs, or you have interior or exterior painting to be done, our professionals are here to assist you! We’ve been working for years in the field so you can count on us to get it done right and get your home looking fantastic. Learn more about us on our website and feel free to schedule your appointment anytime online or over the phone! When you look for the right team you can count on for professional home repairs and remodeling, you can count on us. Contact us here if you have any questions! We will take care of your home as we would ours. With our team, your satisfaction is guaranteed on every call. The appointment was successfully scheduled! Thank you for choosing Drywall Repair & Remodeling Hollywood! Feel free to browse our website for more useful information until our appointment!